It happens to all collectors and dealers. You go about your business, buying job lots, or whole collections to obtain some great pieces, and along with the “great” comes the “not so great”, but the “good enough” to be put aside in your overflow area, be it basement or barn for future consideration. Then along comes the day when you can no longer move in those places and that’s when it’s time to download. Seriously, do not even consider renting more storage space because you will just fill it up in no time. 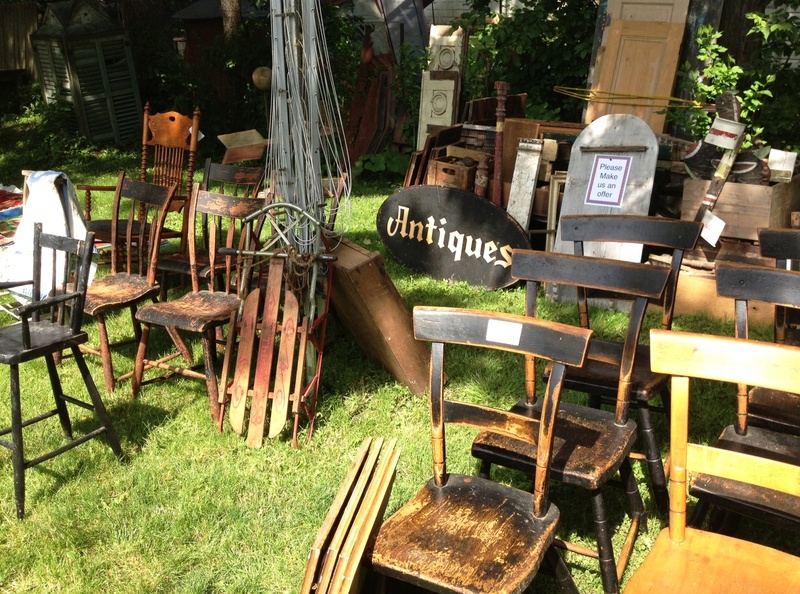 So you can either take the stuff to the auction, or have a yard sale, or a bonfire. My experience with auctions suggests that although they do provide finality, with this type of stock you are looking at maybe 5 cents on the dollar. 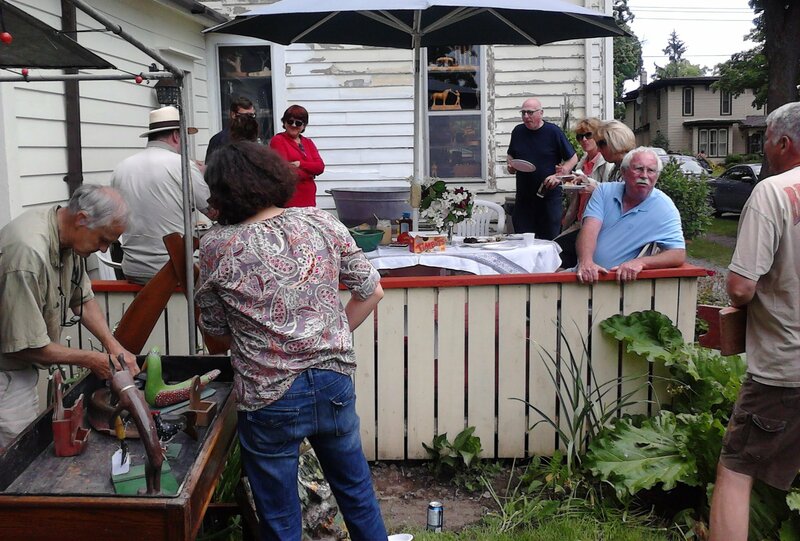 I could never burn even lousy furniture so why not have a yard sale? And why not combine it with a customer appreciation BBQ. Since we no longer do field shows, we have been missing those opportunities to have friendly negotiations and casual exchanges. 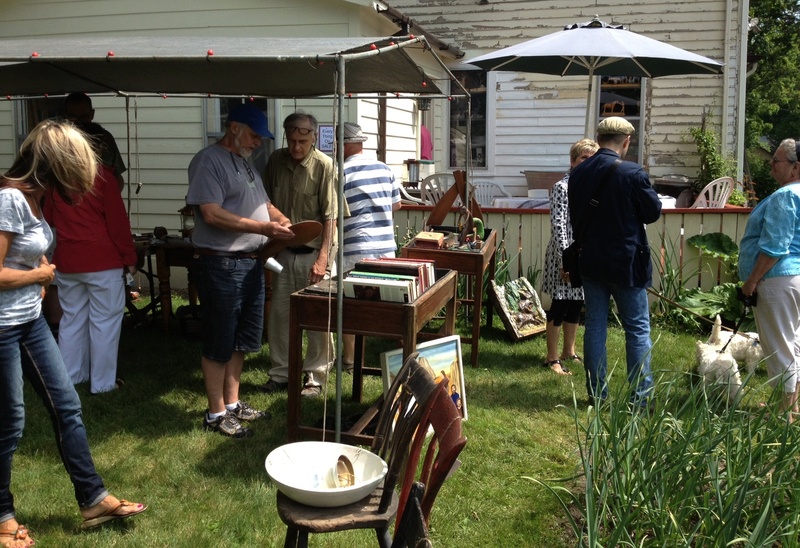 Plus customer Good Will is a valuable commodity which must be nurtured. .
We picked Saturday and Sunday June 15,16, and we put an ad in the Upper Canadian, the local paper, and posted the dates on-line. No turning back now. Naturally, we were hoping for a successful day, but reckoned that even if the sale was a wash (torrential rain anyone) it would at least provide us with the motivation to clear out the clutter, and that alone was worth it. Well happily it turned out much better than that, it was a beautiful weekend, we were well organized with lots of help from family and friends, and gratefully a lot of people came. The feeling was very positive, we had a great time, and most importantly we moved out a lot of stuff, When the price is “right”, the stuff really flies. We are very grateful to everyone who worked hard to pull it off. Everyone worked on set up and tear down. Jeanine and Pat Hall took care of food. Out daughter Cassandra was head of sales. Her husband Anson cooked the sausages and did a lot of running around. My amigos John Hall, Marty Osler, and John Ingram were all on hand to haggle, and charm. Everyone had a wonderful time. It lifted our spirits that so many who came were local, and everyone seemed to want to buy something. In the end, yes it was a lot of work, but it really paid off. Next time, and considering we can’t stop buying there probably will be a next time, It will be a one day event, not two, and maybe in the spring or fall instead of June. But otherwise, let the good times roll. If you would like to see more photos please go to the Shadfly Antique Facebook page.